Tulips, for most people they evoke thoughts of spring, or perhaps clogs and windmills, but mostly spring...for us, the association is a little different, for us it is fall. Crisp cool air, radiant light, blisters from digging, yeah, it was almost too idyllic there, have to dissuade people of the all is rosy on the farm concept. Yes, for us tulips mean fall planting and hopefully spring harvesting. The harvesting part is easy though so the strongest association is with the fall planting. We have tried it a few different ways at this point. Our first year we planted them in raised beds in the hopes they would come back each year. 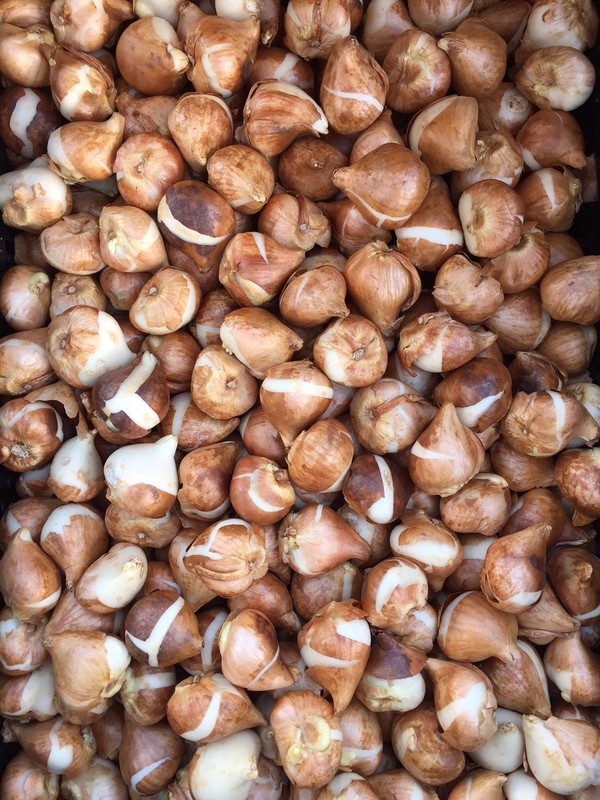 We got exactly one great crop out of them, lesson learned, tulips as a commercial crop are all about the margins, what does each bulb cost? What is the loss factor? What can you sell them for. 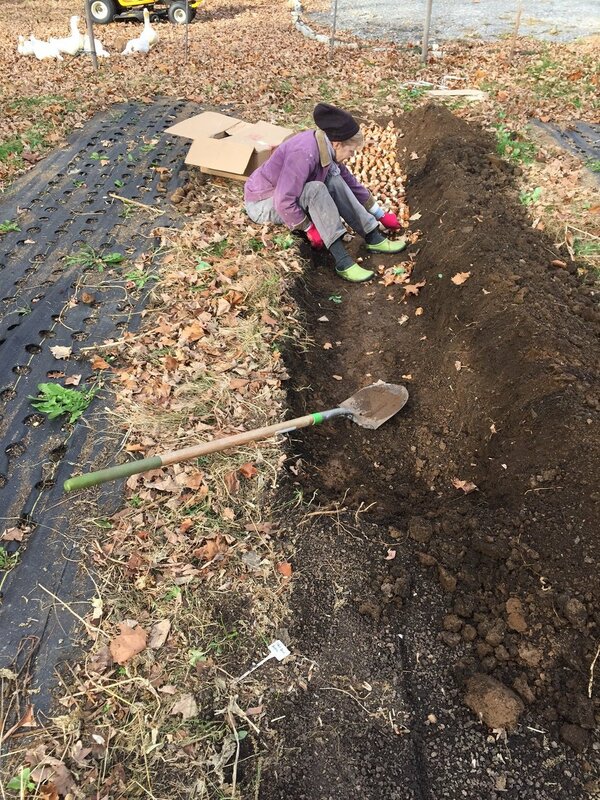 Last year we grew about 150 in very generously spaced trenches. They came up, looked beautiful and we only sold a few because we didn't have cold storage and couldn't control the harvest. Second lesson learned, build cold storage (check). So this year we planted 1,000 tulips spaced closely in a wide trench (trench = blisters). 1,000 might sound like a lot but many established flower farms plant many many thousands. The reason is that tulips (like peonies) can be held in cold storage for a long long time; those beautiful imported tulips you find in the grocery store, they are probably weeks old by the time you see them. It's the closest we come to a commodity crop at BCF. So, this year we went with a couple tried and true varieties, Red Sensation and Evergreen, 500 of each. Our personal taste trends more towards the exotics but if all goes well these two varieties will be front and center at our early spring market stall and we want them to have a wide appeal. Once we had our trench we planted the tulips shoulder to shoulder and then put a layer of leaves on top, sprinkled with kelp meal and crab shells and covered with dirt. Our hope is that the leaves will break down over winter and should benefit the soil structure, the kelp is a slow acting natural fertilizer and the crab shells should be irritating to burrowing critters.